Improve your handling and get rid of that unsightly fender gap with a new set of KW coilovers for your BMW F32 428i/430i. The KW V3 Coilovers for the F32 3-Series feature all of the features of the V1 and V2 with the added benefit of adjustable compression rebound dampening for the experienced driver. 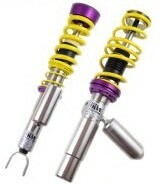 KW V3 F32 Coilovers are specifically designed the experienced driver.